Home Feline Nutrition Cat Milk – Can Cats Drink Milk? Cat Milk – Can Cats Drink Milk? Cats have no nutritional need for milk once they have weaned. Nursing kittens produce an enzyme called lactase which breaks down lactose (sugar) in milk. Once they have weaned, production of lactase stops, and they are no longer able to break down lactose effectively resulting in milk intolerance. Symptoms may include flatulence (passing gas), abdominal pain, bloating and diarrhea. Water is the best fluids for your cat but if you do want to give milk, you can purchase cat milk from supermarkets or pet stores which is lactose-free. Once a cat is weaned can it still drink milk? The answer isn’t a straightforward yes or no. When a kitten weans, most will become intolerant to lactose, which are the natural sugars in the milk. Infants (of all mammal species) produce an enzyme in their small intestine called lactase. This enzyme breaks down lactose in the milk and converts it into glucose and galactose, to produce energy. As cats grow older and wean, the body greatly decreases or completely shuts down lactase production, after all, most mammals stop drinking milk once they have weaned, so it is no longer necessary for the body to produce lactase. This inability to break down lactose is known as lactose intolerance or lactose maldigestion. No, an allergy involves the immune system responding to one or more proteins in milk, however, there is no immune response with lactose intolerance. I have seen it said that lactose intolerance is a digestive disorder, I don’t think this is correct, it is not a disorder, that would assume that something isn’t functioning as it should. It is completely normal for mammals (including cats) to become lactose intolerant once they wean. Almost all cats are lactose intolerant, however, the amount of lactose that can be tolerated will vary from cat to cat. Some cats will continue to produce lactase but at lower levels (lactase persistence). Therefore cats who do still produce lactase may be able to tolerate small amounts of milk even into adulthood. How do I know if my cat is lactose intolerant? The only real way to find out if your cat is lactose intolerant is to give him some milk and see if it causes bloating, gas or diarrhea. 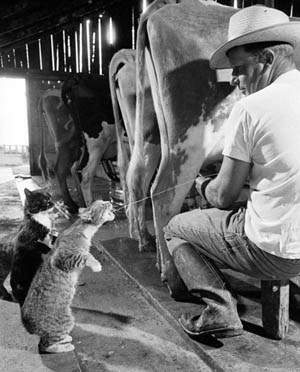 If you find your cat is okay with cow’s milk, then the occasional bowl is fine, but it should be given as a treat only. What about kittens, don’t they need milk? All young kittens MUST have milk in order to survive. The weaning process begins around 4-5 weeks of age, but prior to that, their only source of nutrition is milk. It is extremely important that you do not give a young kitten cow’s milk. The best possible milk is from the kitten’s mother. If the kitten is orphaned and a foster mother can’t be found for the kitten then the kitten will need to be given a specially designed kitten formula, which can be purchased from your veterinarian. Cow’s milk is fine for baby cows, but it is not suitable for kittens. What age do kittens wean from their mother? The weaning process begins around 4-5 weeks, at which time the kitten will begin to try small amounts of food (which should be soft). They will continue to drink their mother’s milk for several weeks longer. Once they are fully weaned, they have no nutritional need for milk again. Do cats need to drink milk? Milk (from their mother or kitten milk supplement) is vital to young kittens, but once a kitten has weaned, he doesn’t need to drink milk. 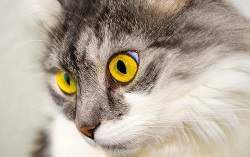 A cat’s fluid intake should be predominantly from their food and water. Milk contains calories, water doesn’t, it should be an occasional treat only. Are there any nutritional or health benefits to giving cats milk? Once the kitten has weaned, there are no nutritional benefits to older cats drinking milk. They should receive all their necessary nutrients via their diet. People are told to have three serves of dairy a day, this doesn’t apply to cats. They acquire all the calcium they need via their diet. What about other dairy products such as cheese and yoghurt? Cats can have a small amount of cheese and yoghurt, even lactose intolerant cats should be okay. The bacteria in these products has broken down some of the lactose. Cheddar cheese and cottage cheese have only tiny amounts of lactose. What kind of cheese and yoghurt can I feed my cat? Avoid the fancier types of cheese such as brie and blue cheese (keep that for yourself), stick with grated cheddar cheese and cottage cheese. Yoghurt should be plain Greek, avoid other types as they contain high amounts of added sugar. Cheese and yoghurt can be given as an occasional treat but shouldn’t be a part of your cat’s regular diet. If you want to give your cat milk, the safest bet is to purchase lactose-free cat milk from your supermarket or pet store. Bear in mind that milk contains calories (water has none) so do keep it minimal. Obesity has serious health implications for cats. Milk should not be a substitute for water, which should always be available to your cat.